How much of your time do you spend complaining or worrying about other people? He’s impossible to work with. I can’t do it because she dropped the ball. He’s really got to learn how to listen. Frankly, it’s sad to watch talented people spend time and energy complaining about others. Time is a finite resource. You can’t make more of it. You only have so much energy to expend living your life. In ‘The 7 Habits of Highly Effective People’, the late Steven Covey points out that we all have a Circle of Concern and a Circle of Influence. 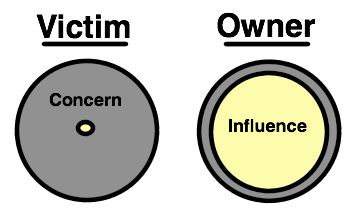 Your Circle of Concern is comprised of everything in your world that you cannot control, like the weather… or someone else’s behavior. Your Circle of Influence is comprised of everything that you can control in one way or another, like what weather you dress for… or your own behavior. 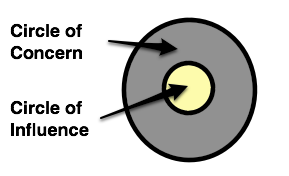 The more time you spend in either circle, the more it expands. The more time you spend focusing on things you cannot control – like someone else’s behavior, someone else’s effort in a relationship, and situations that “happen” to you – the more control you give up and the more you worry. By giving up ownership, you get less of it. The more time you spend focusing on things you can control – like your response to a situation, your effort in a relationship, and situations you’re willing to expose yourself to – the more your influence grows. By taking ownership, you get more of it. Taking ownership over your life and outcomes is difficult. Taking ownership over your life and outcomes changes everything. Trust me, I know what it’s like to feel powerless. To feel like you have no control over your thoughts; To lie awake at night worrying about what tomorrow will bring; To feel like you have NO physical energy and you’re completely emotionally spent; To wonder if you’re just in it too deep and not going to be able to recover. If it is indeed true that you can take ownership over your life – and with each new ownership that you claim, comes more power and control – then there is hope. See challenges as jet fuel for your growth. A difficult situation is an opportunity for you to take ownership over your response and expand your circle of influence. Challenges are like jet fuel for your growth. Listen to yourself. When you hear yourself thinking or talking about what someone else isn’t doing or how life is happening to you, catch yourself. Pause, take a breathe and stop. Speak using ownership words. Use phrases like, “the challenge that I am facing is” or “my part in it was” or “I am working on”. Look to serve. It’s hard to complain about others when you are too busy serving them. It’s also hard to let life “happen to you” when you are proactively helping others. What inventive ways can you surprise someone at work (or home) with an act of service? How can you over-deliver? What do you think? What’s one way that you could expand your circle of influence today? Leave a comment. The 7 Habits was my first personal development book. Owning it is a difficult process to master. I spent much of my early life looking outside but achieved my best when I learned to look inside. Great post. Thanks, Bobby! So true that an inside-out approach to life produces the best/most lasting results. Right on , Ryan! This post is very timely. I’ve been working on being more self aware as opposed to self absorbed. I’ve found that my circle of influence is indeed expanding as I don’t waste time with pity parties or talking about what others aren’t doing or are doing wrong. People definitely follow a servant leader who take ownership. Everyday I choose to do something that will get me closer to being that leader. Wow chad! That’s awesome. I like the idea of doing one thing a day that expands your circle of influence. Hey man this is awesome. Love this post, I was just going through a stage of feeling out of control and feeling like a victim but it’s a waste of time to feel like that. Thanks homie. I’ve been there – feeling like a victim. Glad this post was a little help. So impressed by you, Ryan! What a positive lift to my day – it makes me so happy to see you doing what you love! Thanks Ryan, This Post has really helped me in learning where is was waisting my time , i will surely focus on what is important for me then what is not.